It's less than two months away from Christmas, which means Oprah Winfrey's list of favorite things is back. This year, the holiday gift list is longer than ever with 102 items. 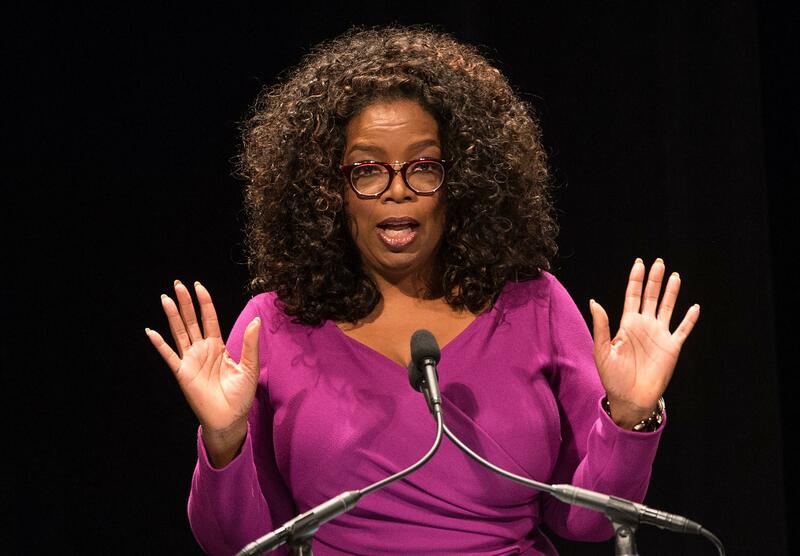 Ranging in price from free (downloads of her Super Soul Conversations podcast) to $2,000 (for a 55-inch TV that morphs into a painting), Winfrey's annual list will be featured in the December issue of O, The Oprah Magazine, including discount codes to plug into Amazon or the websites of the companies themselves. Winfrey's elves, the magazine's editor-at-large Gayle King and creative director Adam Glassman, spend much of the year scouting items for the list, with Oprah herself making the final decision on what to include for everyone — men, women, pets and kids — in apparel, tech, home goods, beauty, food and other offerings. "What Oprah always challenges us to do is to find some new brands, some indie brands, mom-and-pop kind of brands. We always have a fabulous mix of tried and true, and big people, but we also like to infiltrate new brands and also brands made in the USA," Glassman told The Associated Press in a recent interview. LOUVELLE SHOWER TURBAN: Made of quick-dry fabric with a waterproof lining, these turban-style shower caps come in fun patterns and colors to make that blowout last. Oh, and there's an adjustable knot for just the right fit. $40. SMART NORA SNORE SOLUTION: Give the gift of a snore solution that doesn't involve mouth guards, nose strips or straps. It DOES involve a little Bluetooth-enabled, egg-shaped device that sits on a nightstand and is triggered by the snore. It then gently and slowly pumps up an inflatable pillow insert tucked into a pillowcase to shift the culprit's sleeping position and lessen the noise. $299. EMU AUSTRALIA MAYBERRY SHEEPSKIN SLIPPERS: With a sturdy lug sole, these fuzzy slides come in bright pink, blue and orange. Oprah was a bit skeptical at first, Glassman said. "She said, really? I think my, like, Aunt Estelle used to wear those." They're not unlike furry footwear found on runways and in the streets of New York and Paris, he noted. $60. KATZ'S DELI DINNER FOR FOUR: The famed New York City deli will ship matzo ball soup, pastrami, corned beef, mustard, rye bread, knishes, pickles and chocolate or cinnamon babka to your chosen people. "I grew up going to Katz's. My parents grew up on the Lower East Side," Glassman said. "Nobody makes pastrami better." $125. MODEL BAKERY ENGLISH MUFFINS: Due to Oprah's obsession with these muffins, they're back for a second year, Glassman said. She even travels with them and brought a batch to the set of "A Wrinkle in Time" in New Zealand for cast and crew to enjoy. The artisanal darlings from this small Napa bakery come in a set with six original and six spelt. $35. CASA DRAGONES JOVEN SIPPING TEQUILA: Oprah likes her tequila. This bottle for sipping is made by a woman-owned, small-batch distillery in Mexico and is her go-to. It's a blend of silver and extra-aged tequila. The sipping bottle is pricy at $285. Oprah's also offering a tequila blanco at $75 for mixing into cocktails. YELLOW LEAF HAMMOCKS: Oprah once bought a house because it had a hammock hanging in the yard, Glassman said. These classic doubles are made in Thailand by artisan weavers. "When she stopped doing the daily talk show everyone was like, what are you gonna do and she goes I'm just gonna be laying in my hammock reading a book," Glassman said. "That lasted about two days." $199. THE ECHO SHOW: Alexa has gone video. There's a built-in screen to show content of all kinds, even your own security cameras. Ask her to pull up photos and shopping lists. $230.